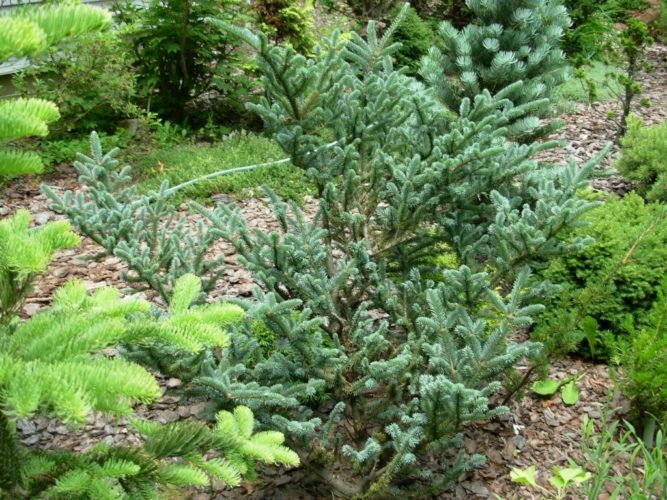 Abies fraseri 'Wingle's Blue Bonnet' is a dwarf, symmetrically conical selection of Fraser fir with excellent Blue color, arguably one of the best Blue conifers available in the nursery trade. After 10 years, a specimen can be considered mature at 4.5 feet (1.5 m) tall and 3 feet (1 m) wide, an annual growth rate of 2 to 4 inches (5 - 10 cm). Abies fraseri 'Wingle's Blue Bonnet' in northwestern Pennsylvania, USDA Zone 5b. Grows 2-4 inches per year. The blue Concolor fir in the background is unrelated.